At the feet of the dread wasteland known as Carn Dûm lie scattered the remains of a pitched and heated battle. Orcs, goblins, wargs and evil men, disbanded and leaderless, riddle the landscape and pose a viable threat while cold drakes, mysteriously imbued with the power of flight, dominate the skies. The carcass of a dragon, defeated and defiled, lies in a vile heap and the victors are wounded, not by a sword, but by the death of one of their own. I'd say we still have a mess to clean up, though the mountain is partially emptied and it appears that a great number have either fled or gone deep within the bowels of the mountain in fear. It will take time to ferret them all out, but it would be well worth while to cleanse the place so that it does not become a breeding ground for other evils," she said in a low voice. The Mithril Knight then turned and walked back to the side of her slain comrade leaving the two Rangers silently dismissed. Cerrimir fell into step along side Harogal, who, as leader of the Rangers of the North, was now formally in charge of ‘the mess’, as the dark, female Knight so aptly described it, at least until reinforcements arrived from the south. And that would take at least a month: a month of tramping through these soul-less hills and ravines looking for Sauron’s scum, dodging and hiding from flying cold drakes. Cerrimir bit the inside of his cheek in efforts to bite back the curse he wanted to hurl out into the grey, clouded sky. There simply were not enough Dunedain to do this. And as for the Gondorians, what use will they be, he mused bitterly. Travelling north at a forced march? They'll arrive exhausted and in need of a rest! The two Dunedain walked with blades drawn; each caked with the dried, black blood of orc and goblin upon them. The slopes of the Carn Dum, pitted and broken with scattered rocks and knurled excuses for shrubs and trees, made for uneasy footing; they made their way carefully to an outcropping of rock which was easily defendable and provided a clear view of the battlefield. Harogal had made it his ‘headquarters’ and a place of refuge for the wounded, Knight or Dunedain. Now the fighting had eased, it was growing into a temporary encampment. Harogal gave his second a look that was a mixture of both commendation and warning. “Perhaps not ‘overtly’, Cerrimir,” he replied. A strange, bright fire suddenly caught Cerrimir’s eye. He turned just as there was a sudden gasp from a group of Dunedain and Knights some distance behind them; Harogal turned just in time to witness one of the Knights simply disappear into thin air. The Ranger slowly shook his head and took Cerrimir by the arm, who stood gaping at the empty space where, moments ago, there once stood a man. Harogal led his second back to their headquarters. “We’ve not?” Cerrimir asked, more astounded by that news than seeing a man disappear. “We don’t have enough men! What does Elessar think we are? Magical, for pity’s sake?” Cerrimir shouted. Harogal stopped short, and pulled himself up to full height. “You’re out of line, Captain! And I’ve heard enough ‘speaking-out-of-turn’ for one afternoon, if you don’t mind. Our KING has given us a task and we will do it!” He sheathed his sword, adding: "Our friend has given us a task, our brother." Harogal looked to Cerrimir, who, like all the Dunedain, was near exhaustion. His second stood firm, his grey eyes cloudy with anger but his tongue was still; Cerrimir was a proud one, always. "Have you eaten anything, taken water?" Harogal asked. Cerrimir shook his head. "Then do so, that's an order," Harogal said, turning back towards his headquarters. "Then take two junior ranks and spread the word of what's happened here and bring back reconaissance. I want confirmation that all our ranks live - but more importantly I want to know where the cold drakes are nesting - and how it is they fly! Orcs, goblins we know how to hunt but as long as those stinking vermin can take to the air, we're vulnerable." "Get a 'polite word' to our brothers back there at the wake that their respects have been duly paid and to return to their duties. If they wish to join the Knighthood, they may; just not today." *Yes, sir," Cerrimir answered with a grin. **Written by Tempest, Mithril Knight, from the thread 'Mithril Knights: Guardians of Middle-earth' and reprinted here, with much thanks. After some searching, Cerrimir found some dried beef, two hard rolls and a few overlooked apples at the bottom of a provisions barrel; all the lembas was gone. Water was harder to find, though he came across a dropped water skin on the field, marked with the arms of the Mithril Knights with good Rhovannion water inside. He ate and drank hastily, aware time was slipping on and the news wasn’t travelling as long as he sat filling his gob. As he ate, he scanned the men and women that filtered into the make-shift encampment; he didn’t see any of his junior ranking men or women. Feeling uneasy, he stuffed the uneaten remains of a roll and an apple into his kit bag and looked for Harogal’s adjutant, who was found sitting under a mangy tarp strung between two dead and twisted trees and pouring over a myriad of detailed maps. The adjutant looked up, her eyes red from lack of sleep. “Have you not heard?” she asked. She could see from Cerrimir’s flat expression, he had not. “Alogar’s wounded. Ellandar’s with him at the healer’s tent,” she added quietly. Her gaze returned to one of the more detailed maps set before her. “Harogal said we’ve not lost a soul, is that true?” Cerrimir asked. “But? But ‘what’?” Cerrimir asked, his face clouding. “I’d get to the healing tent if I were you, Captain,” Casshern said quietly. Cerrimir was at a full run within seconds, arriving at the tent, breathless, within a few minutes. There several Dunedain sat or were laid out on blankets and mats, some awake, some not, many were bandaged but no bodies were laid off to one side, feet pointing west with swords wrapped in dead hands. Cerrimir said a quick prayer of thanks to Manwe and quickly glanced about for Ellandar’s tall frame, finding him finally in the back, kneeling on the ground with his back to the tent’s entrance. “Wait,” a voice called out. A healer approached Cerrimir, wiping her hands on a towel while looking at him carefully for wounds or any sign of trauma. “Are you hurt, Ranger?” she asked. “No, no…” Cerrimir faltered, realizing he did not know this Dunedain woman. “My name is Cerrimir, Captain,” he touched his left shoulder in a brief salute. “Kaya, daughter of Balar,” she began. “My brother, yes,” she said. “Yes, I know, poisoned but we have remedies! ?” Cerrimir asked, trying to mask his alarm. Cerrimir picked his way to the rear of the tent; some of the walls were up, to let in air, other panels were down. Alogar lay in a snug corner, free from drafts but the light was dim. Cerrimir squinted as he stopped; his first lieutenant’s face was ashen and his eyes fast closed. His second lieutenant, Ellandar, looked up at the sound and he shook his head. “No, no, he sleeps,” he whispered. Cerrimir nodded, relieved. The bandaging around Alogar’s side betrayed the severity of his wound; the binding was wide and thick and an angry, red stain seeped into the crossing linen. “How many?” Cerrimir asked. Ellandar sighed heavily and stood. “A dozen!” Cerrimir exclaimed. Kaya shushed him from across the tent. “Gweanyd was with us, as well. He… ” Ellandar said hesitantly. “Gweanyd!? He was ordered to stay here,” Cerrimir barked. Gweanyd was only 20; far too young in Dunedain years to fight. A tug on his sleeve gave him pause; Kaya now stood next to him. “I said ‘low voices’, Captain. That means ‘quiet’,” she said sternly. Cerrimir nodded and waited for the healer to leave them. He pulled Ellandar by the arm to the far end of the tent. “So explain to me why Gweanyd, who is too young to be in the field, was, in fact, in the field? !” Cerrimir hissed. “Alogar told Gweanyd he could tag along, didn’t he?” Cerrimir asked. “Yes, sir. If he hadn’t have been there, Captain, we’d be dead,” the second lieutenant offered. “Clearly,” Cerrimir remarked. “Where is the little blighter now?” Ellandar answered by pointing across the aisle to where young Gweanyd lay, wrapped in a blanket, sound asleep with the right side of his head bandaged. “He took a good crack across the skull but kept fighting,” Ellandar said. “And you?” Cerrimir asked, now worried. “Ah, a jab with a knife, is all,” Ellandar replied, pointing to his bandaged right arm. Ellandar and Cerrimir looked down to where Alogar lay; his dark blue eyes were open and looked black in the dim light. With his ashen skin, he looked like some half-wraith ready to seep into the soil. “Captain,” he rasped a second time. “I permitted Gweanyd to accompany us,” Alagor whispered. “I know I disobeyed your orders, sir, but…” Alogar coughed, causing his entire frame to buckle under the thin blanket. “Kaya!” Cerrimir called. He looked on helplessly as the healer arrived at Alagor’s side and attempted to make the wounded man drink a thick, green syrup from a small cup. Kaya looked up at Cerrimir and wordless bade him to leave. Cerrimir held up a hand, asking silently for a bit more time. The healer nodded and left. Alogar’s eyes looked clearer, thanks to the potion. He found his voice once more. “I disobeyed...” he begain. Cerrimir interrupted him. “Not enough of us,” Alogar managed. Alogar nodded with a look of relief on his face. He then took a deep in breath, exhaled and died. “A ‘medic’?” Ellandar asked with surprise. “And a woman,” Gowther added with a hint of displeasure. “We’re not setting up field hospitals, are we?” Ellandar asked. “So that’s what she’s going to do,” Cerrimir cut in. “Patch Rangers up and send them back here - at my direct request.” He delivered the final sentence sharply, meaning to cut off any more discussion. “Then why the weapons?” Gowther asked, glancing over the wrapped bow, quiver and sheathed sword. Cerrimir suppressed a snarl; the young lieutenant would learn soon enough to listen for what’s said and not said. “Would you walk in there unarmed, Lieutenant?” Cerrimir asked. “Well I, for one, am pleased,” Ellandar said, smiling. “Another bow, another blade - all’s the better! Perhaps we can spar a bit, when time allows?” he added. “When time allows, yes, why not,” Kaya said. “We’ll have to share what’s in it between us, then,” Ellandar said, taking his pack off. “I’ve enough in mine,” Cerrimir grumbled as his eyes caught sight of two runners leaving Harogal’s command tent. “You three sort it out,” he added just as a third runner set off, this one moving north west, towards the baggage train and supply depot and past where Cerrimir and his small company stood. Cerrimir’s instincts were twitching; something was afoot. His sharp eyesight noted the runner; a young Dunedain named Arethal who, if memory served, was a fine musician. “Arethal!” Cerrimir called out. “Come here!” he ordered, waving the lad to him. Young Arethal stopped, his hand clutching a rolled piece of parchment and for a moment he looked torn between his task and the beckoning of Cerrimir. “Come here, lad! It won’t take a moment!” Cerrimir called out again, this time making sure to smile warmly as he did so. The young boy’s resolve broke and jogged over to where Cerrimir stood. “Captain?” the boy asked, expectantly. “Yes, I see you and a few others dashing about. What’s going on?” Cerrimir asked innocently. “Or is it secret?” he added with a wink of his eye. “No, I don’t think it’s secret, no,” Arethal said. “But it concerns the Mithril Knights!” the boy said excitedly. “Oh it does, does it?” Cerrimir asked, doing his best to hide his irritation with the two words. “I’m not sure; I heard them speak of Arthenain and Deonyc,” Arethal replied. “Another good man.” Cerrimir said, assessing the situation. Cerrimir was momentarily taken aback by the young boy’s question. In the heat and press of the last two days of battle, the chance of there being a pile of golden coin now sitting, unguarded, in the dark pits of Carn Dûm was the farthest thing on his mind. Which wasn’t to say it wouldn’t be on another person’s mind; some one, upon the magical and momentous death of the dragon, would be thinking about it, no doubt, and lustfully. “I really don’t know, Arethal,” Cerrimir replied. “But I will say this; whoever goes into that black hearted mountain better take plenty of torches; they’re going to need them.” And, for once, I am glad it is not me and my men...down in that pit.Cerrmir thought happily. “That’s what the Mithril Knight said!” Arethal said with a laugh. The boy saluted Cerrimir and set off at a full run, towards the baggage train and supply tents. Cerrimir returned to Gowther, Ellandar and Kaya who each now stood with larger packs and slightly bowed shoulders. “Are we done?” Cerrimir asked. “Aye, sir,” Ellandar answered, taking up his new weapon. “You can call them your Great Aunt Salima for all I care; just wrap them up!” Cerrimir barked. The cackle of laughter rang out, from high above. Three Crebain circled, cawing and cackling, as if amused by the four of them and their second born antics. They then flapped away, rollicking in the air above the camp. “Crebain? From Dunland?” Ellandar commented. “They’re a long way from home,” Gowther said suspiciously. “Roast dragon’s on the menu, I imagine,” Cerrimir said with a grin. Kaya looked momentarily startled, and blinked once or twice, before answering, “Anym...? Ah, no, I’m indeed not. 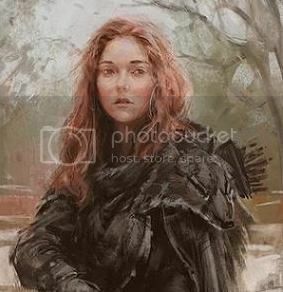 Cerrimir.” She cleared her throat, and looked at the crows again, shielding her eyes from the sun. “Well, we’ll call you ‘Healer’, then, if that’s alright with you,” Cerrimir said with a nod to Ellandar and Gowther. “Right, we’ve been dallying around here long enough. The sooner we start, the sooner we’re back. Our first assignation is with Yrorcyn’s force, he’s commanding about twenty five Rangers stationed on the southernmost rock spur butting up against the remains of the fortification wall, here.” Cerrimir pointed to the small red mark left by the adjutant lying about due west from where the command encampment was positioned. “With luck we’ll be there shortly before nightfall. They’re so close, I imagine they already have all the news we’re about to bring, but not their orders. And as we know, orders are orders,” Cerrimir grumbled, pocketing the map. He set out, walking west with the lieutenants and Kaya following. They walked westwards into a murky sun, or rather, they marched. They kept a brisk pace as the warmth of the day ebbed and the sky filled with high, thin wisps of cloud that threatened a change. Cerrimir took point, Gowther, the rear and Ellandar and Kaya walked abreast; Kaya often turning aside to inspect the small plants and flowers that blossomed and grew despite the clime and the soil. She was keen not to overlook a herb or plant with useful qualities; some she claimed, other’s she left to fight for their survival. When she did stop, the men would not and Kaya would often need to jog, with the heavy pack on her back jostling on her shoulders, to return to ranks. No one spoke. Ellandar and Gowther each shouldered their long pole axes, the spear- axe shaped heads wrapped with sackcloth, unwound from a wheel of cheese from the food provisions; Cerrimir was the only member to walk with a blade bared. No one suggested they stop to rest at any point, either. Cerrimir needn’t say it, they all knew; they’d left later than they ought. Commander Yrocyn’s camp lay some eleven miles due east on the southernmost end of the ruins of the old fortress; it was a strategic post - a section of high fortress wall, still sound, that cut through two twinned hills. The fortress wall once enclosed one hill into the security that was Angmar’s keep yet dwarfed the other that was exiled beyond. That remaining section of wall, with it’s defensive height, afforded an excellent view in all directions and was the first position taken by the Rangers before the fighting began. The ruins of the Fortress of Angmar had crumbled and fallen in haphazard ways, creating walls where there were once parade grounds and low, tumbled mazes of rock and stone where before stood tall and mighty towers and Yrocryn’s camp effectively controlled the only passable egress into the ruins’ expanse: a large gap in the old wall, which, combined with the odd and arbitrary cascade of ruins, created a natural path northwards.This was Cerrimir’s prescribed route and Yrocyn his first stop. Ellandar’s long legs kept pace easily enough and Cerrimir, though shorter in stature, never seemed to fatigue in any endeavor. Gowther, Ellandar could not see, as the Second Lieutenant resolutely brought up the rear but, from experience, Ellandar knew Gowther would not be taxed by the pace. No doubt the young Ranger was striding on with eyes westward and, like Ellandar, looking up for a winged speck of dark grey. It was the healer that Ellandar kept his attention on. Kaya had insisted on taking an equal share of the provisions and supplies from the extra pack, adding it, uncomplainingly, to the medicines and healing aids she’d already packed - despite Ellandar’s protestations. Gowther, he’d noticed, didn’t join him and simply said ‘a third is fair’. To Ellandar’s thinking, was it wasn’t fair at all; ‘Each to his or her capacity and therein lies the honor’, as his father had always said. The Healer was carrying far too much, he thought, and seeing as she was intent to augment her supply of herbs and plants - as any decent healer would - Ellandar worried she would expend her energy too soon. Dusk was coming. With the dusk would come the drakes. If not safely encamped by then, they would need to run. “Kaya, I was wondering - your pack,” Ellandar stopped with the sharp, askance look the woman gave him. He cleared his throat and tried again. “I’m concerned we’ve not distributed the weight fairly; I think you’re carrying too much. We should stop, redistribute... you’re...” Ellandar stopped again, silenced by another look. “I’m fine. Really,” Kaya said, trying to hide the wheeze in her breath as she spoke; she stole a glance over her shoulder. “But thank you. For offering.” Quickening her pace just a little, as she often had to do to keep up with Ellandar’s longer stride, she narrowed her eyes to overlook the brush and stunted-tree filled landscape ahead of them. “Surely, we’ll be there soon.” She prayed they would be, at least, as she could handle the distance and the terrain, but she was used to travelling light and all that, combined with the strain to have her shorter legs keep up with the undermining pace, was turning this endeavour into quite the challenge. Gowther surely wasn’t the first man she’d met who uttered his doubt that her abilities outweighed her becoming a burden. Back home in Combe where flying Cold Drakes had seemed so surreal and the Northern mountains not half as harsh, she was aware this could happen again. The healers’ tent, in that light, had been a safe haven: no man brought in there would look at her in doubt to then dismiss her, thinking her incapable of mending his wounds. Kaya considered many things in that hour of reprieve she had been given: the obvious - life, death, helping those in pain; defending that what you love, focus. At that point everything else seemed futile, but now that the weight on her shoulders seemed to become heavier with each step; she silently cursed her pride preventing her to accept the gentle offer. “A few hours? Why, I’m surprised they let you keep them that long!” Ellandar commented. “Ah, so now I know the secret to you and your healing success, Kaya - you put all your charges into a state of soporific docility,” Ellandar announced loudly. Gowther coughed discreetly behind them. Ellandar cast a glance over his shoulder, faced forward again and assumed a sufficiently stern face. “You have my express permission to place me or anyone under my command into as deep a tranquilized state as required,” he added, tossing a quick nod back at Gowther. “Yes,” Ellandar added, his face now solemn. “By the Grace of the Valar, let’s hope.” Ellandar turned once more, catching sight of Gowther, striding along behind them; the young Ranger’s brow was knitted tightly and his face looked stoney. “How are you keeping, Lieutenant?” Ellandar called out. “We ‘need’ to, Second Lieutenant?” Ellandar asked; his voice was edged with just enough disapproval to give Gowther pause for thought. “I mean only that we should, perhaps, consider it,” Gowther added. “We should, perhaps, consider it...?” Ellandar added, expectantly. “Yes, perhaps we should, Lieutenant,” Ellandar agreed, heavily. He looked over to Kaya with a silent expression that asked her if this was possible. She looked up, eyes widening slightly but with a firmly set mouth that told the Ranger she was willing to try. Ellandar nodded and reached over, pulling the strap to one of Kaya’s satchels off her left shoulder. He then reached behind her and unhooked a large water skin that bobbed and dangled off the back of her pack. “What else?” he asked her, bundling her things into his arms. She looked up at him, then down at the various pouches and bags hanging off her belt. “This,” he announced, untying her wrapped bow and quiver free from her backpack. “It’s not as if you’re in the position to use it, wrapped as it is,” Ellandar added. “You need to string this bow and have it to hand, at all times, yeah?” Allowing Kaya to take a position in front of him, Ellandar unhooked and untied a few more bags and parcels as they walked. “Gowther, take these,” Ellandar called out, tossing the satchel, waterskin and two pouches filled with food. “That’s an order. I will keep your bow,” Ellandar said, turning back to Kaya. “And, if you could help me...” Ellandar held open a large bag that hung at his waist. Kaya took it, kept it open as Ellandar dropped her things inside; parcels of herbs, pouches filled with bandages, a bag filled with small pots of salves and lotions. The Ranger’s bag now bulged awkwardly and bounced heavily against his hip as he walked but Kaya felt a small sigh of relief that the weight she carried was now lessened. Ellandar called out to Cerrimir, who, infatigable, had advanced a small distance ahead of them all. Cerrimir paused in his stride and looked over his shoulder. “The Second Lieutenant would be correct. Move your arses.” Cerrimir began to jog, sword in hand, and did not look back. Ellandar looked back to Gowther, who had lost his stoney expression was was now looking pleased, if not somewhat bemused, at hearing Cerrimir’s acknowledgement. The trio followed suit and began to jog as the sun sank low in the sky. The clouds, once high and wispy, now thickened, blotting out the few patches of blue with a wash of milky grey, forcing the sun to push through thin patches of white as it dipped low. As they jogged, Ellandar and Gowther scanned the skies. They would be stirring soon, in their hidden nests, the winged Cold Drakes of Angmar. They’d soon feel the sink of the sun and the call of the night sky and set forth, into the dark to do battle afresh. There was always one Drake, however, one brave Drake that risked blindness in the late afternoon sun, to search out prey, to find the enemy before the day ended. That drake would fly back to the nest and tell all of what it saw in the bright, blinding light of day. That drake was the one they watched for; that was the drake that truly heralded the coming of night. Cerrimir halted at the crest of a small ridge and waited for his men and the healer to catch up. Before them lay the final three or four miles to the ruined section of the fortress wall and Yrocyn’s camp. To their right, and sweeping off into the northeast, were the disordered remains of the fortress’ fortifications; they lay like a forest of jumbled stone, overgrown brush and stunted trees. “How much farther,” Kaya asked, breathlessly. Cerrimir looked over to her, sharply at first but he quickly hedged his voice. “Three, four miles,” he replied evenly. “Wait!” Gowther cried, pointing up at the sky. Far off, high above in the sky and northeast to where they stood a small grey speck swam lazily in air, highlighted sharply by the white-grey of the gathering clouds. “DO IT!” Cerrimir barked and then his eyes widened. Reaching out with his left he pulled Kaya to the ground and swung his bare sword in an arc, nicking the clawed foot of an attacking drake. It screeched in frustration and with awkward thrusts of its two, misshapen wings it rose up into the air, in preparation for another lunge. “CAPTAIN!” Ellandar cried. “Take this!” He held up his poleaxe, waiting for Cerrimir to sheath his sword before tossing it over. Gowther moved into center position, thrusting and stabbing with his own poleaxe at the second drake while Ellandar began to shed his pack. “Gowther, you next!” Ellandar cried. With her eyes on the drakes flapping close above them, Kaya rushed to her feet. As threatening as they were, they did not possess the smooth agility she had seen in raptors when they circled their prey. These creatures lurched about in mid air, dipping awkwardly as if the very air they moved in frustrated them with each flap of their ugly and monstrous wings. Cerrimir, now with Ellandar’s poleaxe - its sharp tip stained with black blood, stabbed up at a drake that lunged suddenly. Kaya took a few quick paces forward, and stepped over one of the bags Ellandar had already disposed of; she looked to him and saw Ellandar’s hands were upon his belt; Kaya’s medicines in the full bag that hung from it. Despite Kaya’s protests, Ellandar dropped the bag that hung from his waist and ran. His bag tumbled to the ground with a thud, spilling part of its content as it rolled over. Cursing, Kaya made straight for Ellandar’s discarded bag and desperately fumbled about for the few items she could identify in the gathering dark: a pouch holding rare herbs which she quickly tucked in her shoulder bag, and a phial containing a tinted liquid. Accidently her groping fingers caused for the phial to roll away from her, stopping just out of her reach. Kaya extended her arm towards it, when from the corner of her eye she noted a dark shape drawing near. Two large, clawed feet touched upon the ground, followed by two, shorter front legs; razored talons sprouted from each of the drake’s claws. A sharp, shrill shriek of triumph followed; a drake had managed, finally, to come to ground. Her hairs standing on end, Kaya reached for the hilt at her side and she swiftly twisted around, unsheathing her sword. The blade pointing at the looming form, her breath caught in her throat at the sight of the snapping rows of teeth closing in. Cerrimir knew the meaning of that screech; he’d heard it too many times since the battle’s start. He turned to see the landed drake, Kaya’s crouched form, a flash of bright steel. Ellandar was racing towards Gowther who, still encumbered with his packs, kept one drake aloft. “Ellandar!” he cried.”To me!” Cerrimir then turned on his heel and ran back. Another screech, this time of pain. Kaya, now upright, held a blackened sword while the drake raged before her, blood streaming from it’s gnashing jaws: a direct hit, straight into the beast’s mouth. Cerrimir and Ellandar’s cries mixed with the drake’s; the beast recoiled, confused by the pain and the bright steel. The poleaxe was passed, Cerrimir’s sword unsheathed. The drake’s bloodied jaws lashed and snapped, first at Cerrimir, then Kaya. The tip of the pole axe piercing it’s side caused yet another screech of pain; it lunged for Ellandar but his weapon kept him safely distant. ‘If you can, lunge at the base of the wing’, Cerrimir had said during her hasty induction. ‘The hide is thinnest there.’ Her blade slid, effortlessly, into both hands, blade down. The wing lifted; she plunged her sword down, deep into the root of the misshapen wing and quickly withdrew. A cry of pain escaped from the drake, quickly followed by another - Cerrimir having succeeded in hacking part of the beast’s other wing during Kaya’s attack. The drake, now bellowing, pushed frantically at the air with it’s wounded wings, desperate to escape. Ellandar harassed it as it lifted, landing a deep thrust into it’s abdomen before it finally rose to safety. “There are two more,” he cried. “The watch fires are lit!” Gowther cried. Cerrimir turned west; there, a mile’s distance away, high atop the ruined section of wall that served as the Yrocyn’s base, as well as on the top of each adjacent hilltop, flames sprang into life. “Gowther, drop that pack!” Cerrimir cried, sheathing his sword. “You, run!” he cried at Kaya. “Go for another bag and I’ll cut your hands off!” Grabbing Ellandar’s poleaxe once more, Ellandar then took Gowther’s. More packs thudded to the ground. Cerrimir took up point, Ellandar the rear, their poleaxes thrusting madly while they ran towards the fire. The peal of a horn sounded, clear and bright in the evening’s gloom. Small points of light could be seen, snaking their way down the northern hillside ahead, six in all. The horn sounded a second time. “It’s about flipping TIME!” Cerrimir bellowed. “What? !” Kaya asked, her view blocked. Kaya took the last few steps that stood between her and safety - the blazing watch fires on top of the hill, where the dark silhouettes of Rangers awaited Cerrimir’s company and their escorts. Drifting embers, a toasting heat, and the crackling and popping of the kindling pine wood reached her before the murmur of voices did. She turned around immediately and, catching her breath, gazed down the steep slope that had been the final challenge of their race. The last of the Rangers that had come to their aid passed her by, but Kaya looked away from the broken flames of the torch he held. The void washed in ink loomed ominously before her, veiling most of the haphazardly route they had taken with the drakes circling close above them. Thanks to the watch fires the drakes now kept their distance, but the whoosh of their wings could still be heard as well as their eerily screeched communications. Kaya did not know anything with certainty about these drakes other than what Cerrimir had told her in passing. Days spent in the healers’ tent basically had been preceded by weeks of traveling, and during neither occasion she had caught sight of these creatures. Their screeches she had heard plenty, but mostly from afar and without opportunity to observe the behaviour that accompanied the different sounds. Were they crying in frustration over their escaped prey? Could they pick up the scent of an injured one in their midst? Was there a protective bond amongst the drake population or - were he considered weak enough - would they dare to attack one of their own? Were they already measuring the stabbed drake up? Were his wounds no worse than chafed knees and the night young enough for the drakes to go in search for a less resilient appetiser? Or had they the intelligence to look for weaknesses in the camp’s defences, and would the night bring no rest at all? More questions whirled through Kaya’s mind while she turned her gaze westward; the sun had dipped out of sight and the last strip of olive flecked with dark golden that brushed the horizon would vanish within minutes. Was such a drake attack going to be a daily event and, if so, would the abandoning of their bags become one, too? What then was her purpose of coming on this mission? Her hand touched the one bag she had refused to let go of. It rested against her hip, safely hidden underneath her cloak, but contained only a minor part of the medicine she had carried out of the main camp. There were many ailments she would not be able to cure now. In frustration, she kicked at a boulder and sent it flying off the slope. A healer without their medicine simply was like a warrior without their weapon: useless! Her sword, which she still held tightly, drew the Dúnedain woman’s gaze. Fascinated, she looked at the glistening black that covered the blade. When she twisted her wrist, the light of the watch fires reflected and gave the black blood a hue of liquid fire. More so than her still ragged breath, or the presence of the drakes up in the sky, the blood on her sword revealed itself as her one reality and provider of a long desired reassurance. Kaya suddenly threw her head back, smiling broadly and all but chuckling. In the face of death, Kaya, daughter of Balar, did not freeze and neither did she cower away, or squeal like a pig about to be slaughtered. Snapping rows of teeth, triumphant screeches, lost medicine and cranky blusterers be damned, her cool-headed reflexes had not abandoned her despite the gap of many years since her last brush with danger. The voices behind her, no longer a steady murmur but now clear conversations, pulled Kaya out of her private flush of victory. Her linen chemise was clammy against her back; she shivered and hoped for the heat of the fires to penetrate through her layers of clothes before too long, to dry the sweat soaked garment. She pulled her cloak’s hood over her head against the wind that sporadically lashed out, making the flames of the watchfires dance like tortured spirits. Suddenly the voices rose. Patting her pockets in search for cloth to clean her sword Kaya turned, curious to find out whose party they had crashed. A small clutch of Rangers appeared out of the darkness, some bearing lanterns, and, at seeing Gowther, a few called out his name with genuine surprise. They crowded around the youngest of Cerrimir’s troop, jostling him and patting his back in congratulations upon seeing his new star of rank on his chest. Ellandar glanced down at his right arm. “It’s alright. Perhaps you can look at it in the light of day,” another up swelling of laughter drew their attention back to Gowther and the small band of Yrocyn’s men; they now shared an open jug between them, the terror of the Drake attack clearly forgotten by Gowther. “I’ll see about those provisions,” Ellandar said, turning away. “Lieutenant Vadry! I’ll repeat myself for the last time; my orders are to speak directly to your commander...” Cerrimir was heard saying. “Doesn’t sound as if things are any clearer,” Kaya said quietly. Ellandar chuckled and gave her a knowing look over his shoulder before melting into the shadow that sat between the watch fires.